Medical urgencies may come up any time. They are very unpredictable and hence, need to be planned accordingly. 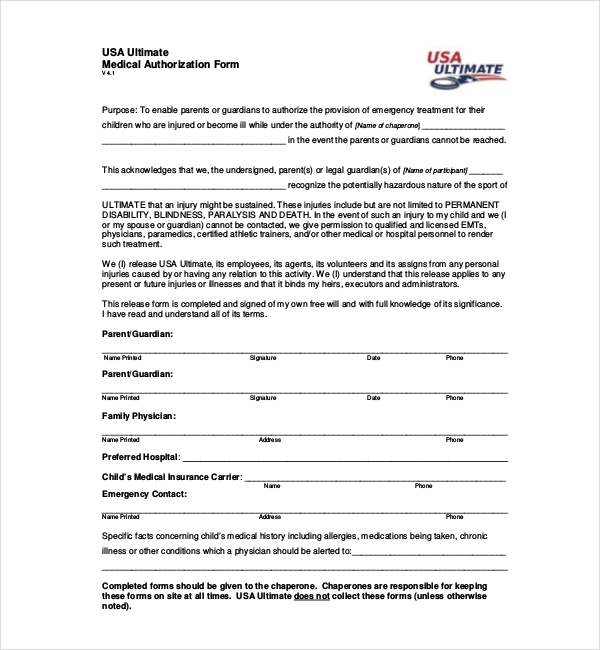 The medical authorization forms are for people who use it to declare, who the in-charge for the medical treatment of the patient will be from thereon. The person may be the patient’s parents or a legal guardian. 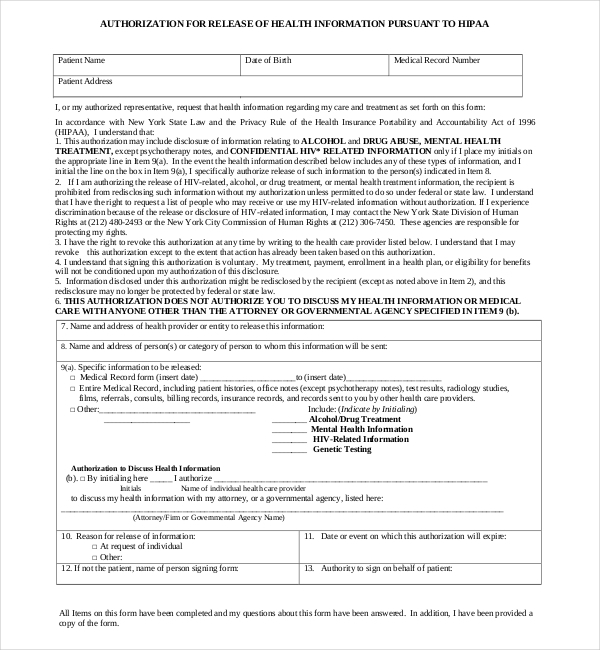 This form is submitted to the hospital authorities for their record and information. 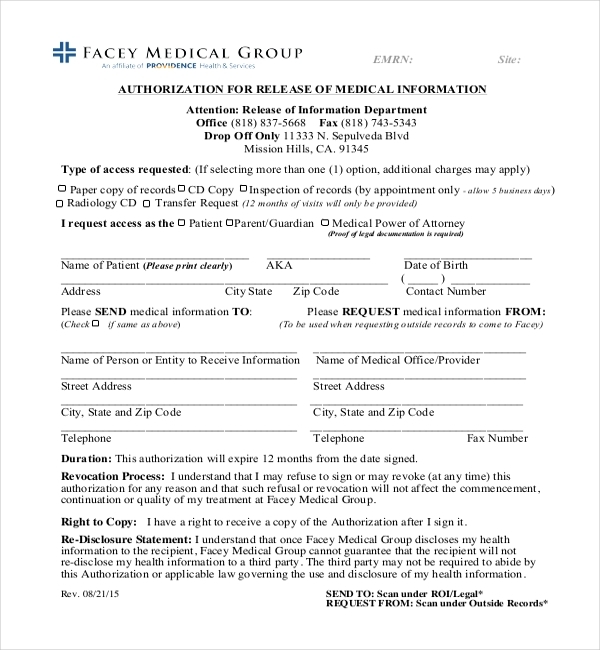 Some forms are also for medical centers so that they have proof of authority to release medical records as necessary and also for Insurance claim processes You may also see Medical Release Forms. This form gives temporary permission to an adult so that he/she can provide and arrange for the medical care of the patient in question. This is used in emergency cases where the parents or any legal guardian is not present at that moment. The form requires minor’s details and information for medical treatment. This form is to enable guardians or parents to approve of emergency treatment of the children who are ill or have been injured due to an accident. 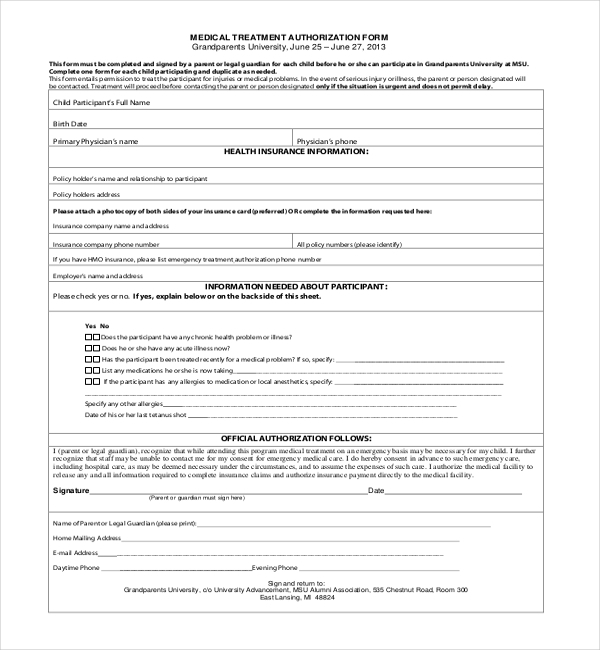 If the parents are not there at that time, this form is required to be filled up either by a legal guardian or next to keen or anyone who can be contacted. A person can be requested to fill the attorney medical authorization form for aiding an individual and his/her attorney in determining the nature and extent of claimed injury, determining the liability, knowing the benefits, compensation, expenses and damages. The information given can be disclosed by the attorney. This form is used for recording all the information. 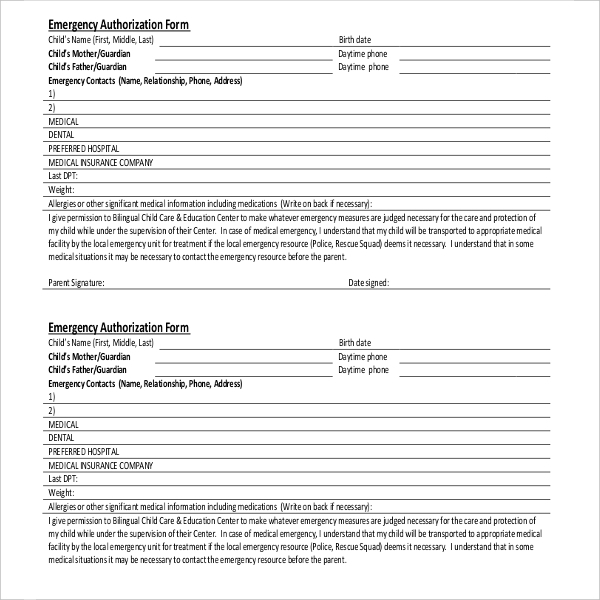 This is a form regarding the authorization of release of the concern person. The guidelines are given about who can authorize the release. These guidelines are to be maintained strictly. The form is to be signed duly and submitted. 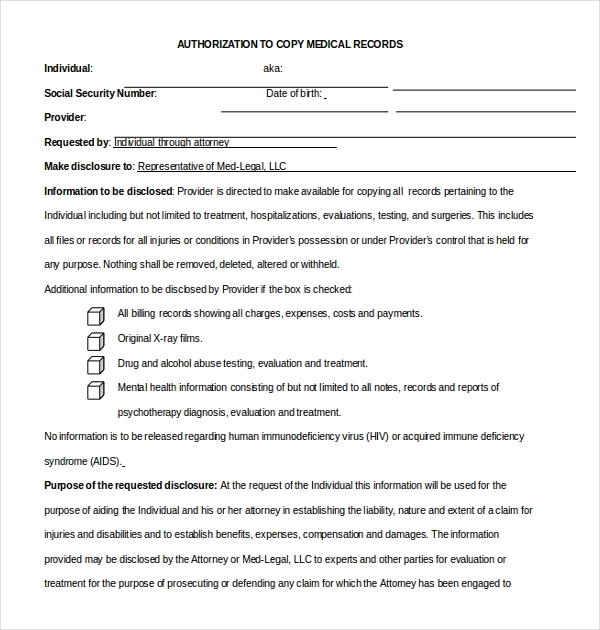 This form is for releasing information of specific records of the patient’s health. This will help the person get all the information they require for the treatment in future. The release of medical records like of injury, sexual disease, bone density test, mental health, immunization only or others and how would they receive it (cd, paper, transfer request etc.) will be subject to the person who fills the form. The mode of payment is decided and the expiration date is also given in such forms. Health centers can release medical information so that patients and their family can get help for insurance purposes. 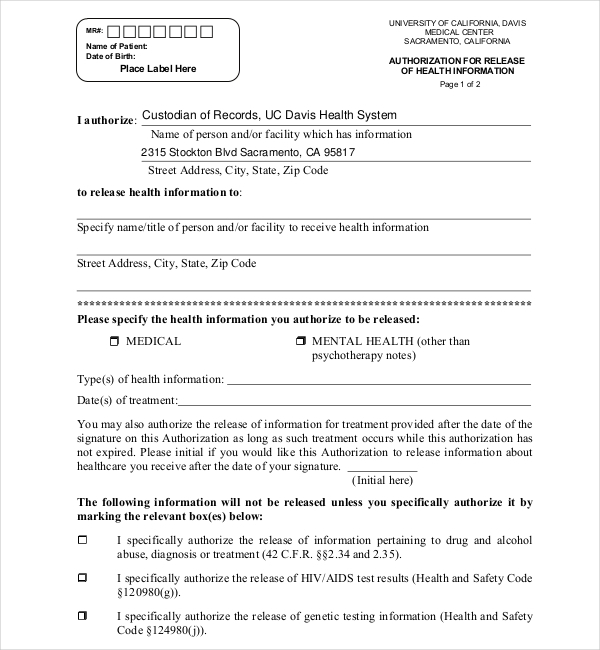 The form has fields to fill up like whom to release health information to, who authorizes it, specification of health records to be released and purpose of the release. The parents or the guardian have to fill in this form for their children. This form is like a consent form from either of them to the school health program. In case the child faces any emergency, this will be helpful. In this form, the physician of the child has to fill up the required section as well. From information of medicines to be taken to diagnosis, circumstances everything has to be filled up. Day care is built for children’s interaction and education purposes. They are also looked after when the parents are busy with their work. At any time if the child faces and emergency, this form will come handy. 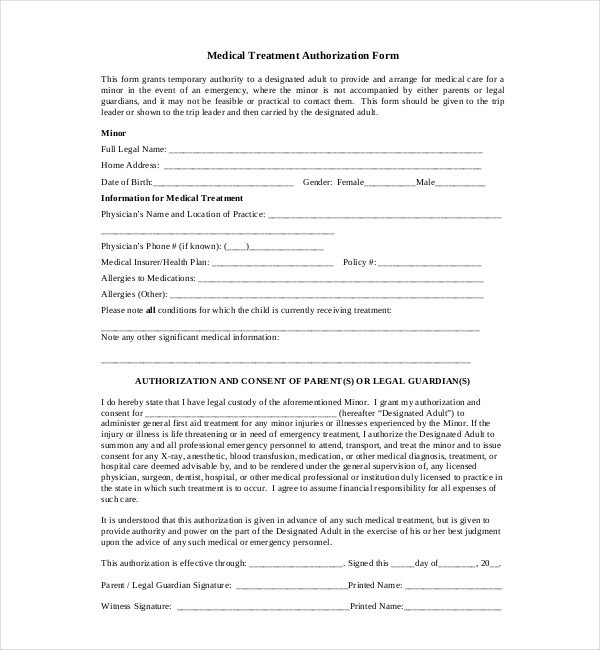 The parents need to sign this form after giving medical information of their child. Through this form, the parents declare that the child’s treatment can be done by the day care center in case anything happens. Full cooperation and protection is handed over to the center. 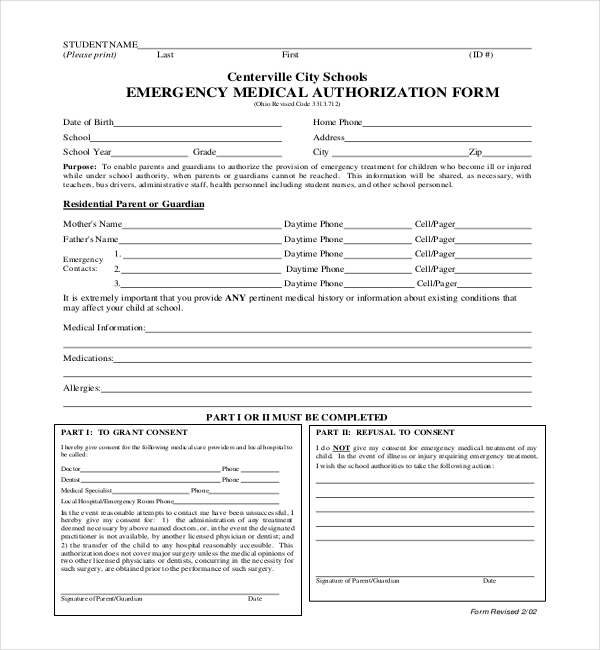 The sample form for emergency medical authorization is for guardians and parents who need to declare that the child’s care and treatment must be taken care of, if any health emergency arises, while he/she is under the school authority and when parents or guardians cannot reach for assistance. This form is for those who have faced any kind of injury and seek medical assistance. The employer carefully goes through the form of the patient/employee and has the power to either approve or reject the application of his employee. 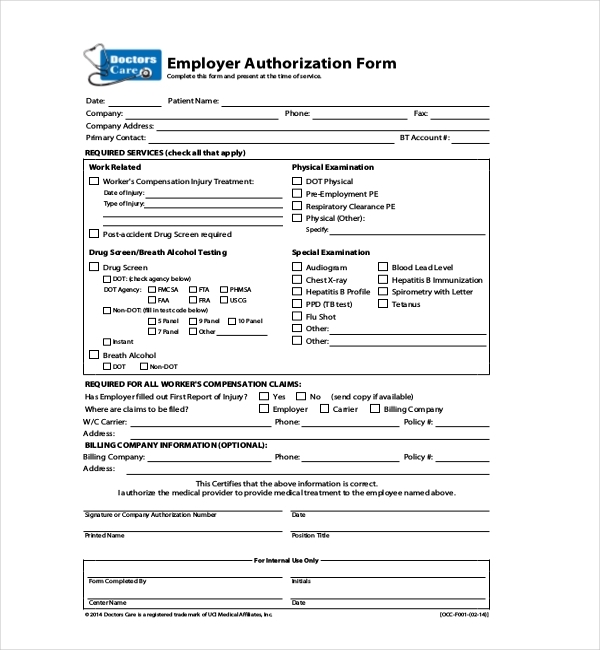 The form is for giving medical assistance to the employee by his/her employer. Sections like Compensation claims, required services, billing company information are required to be filled up by the medical provider. 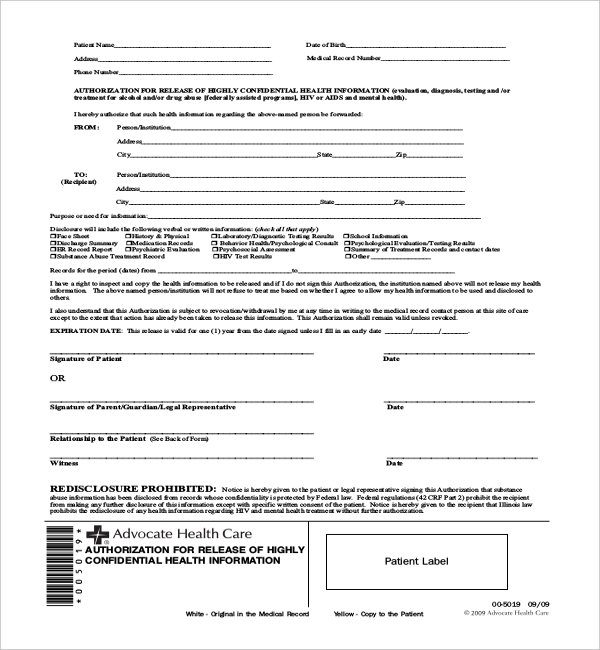 The patient has to fill up this form and give it to the Florida medical authority so that the health records are released. Several fields are to be filled in order to get the health records. some of them are the purpose for the record, records to be provided to, what kind of records to be released etc. 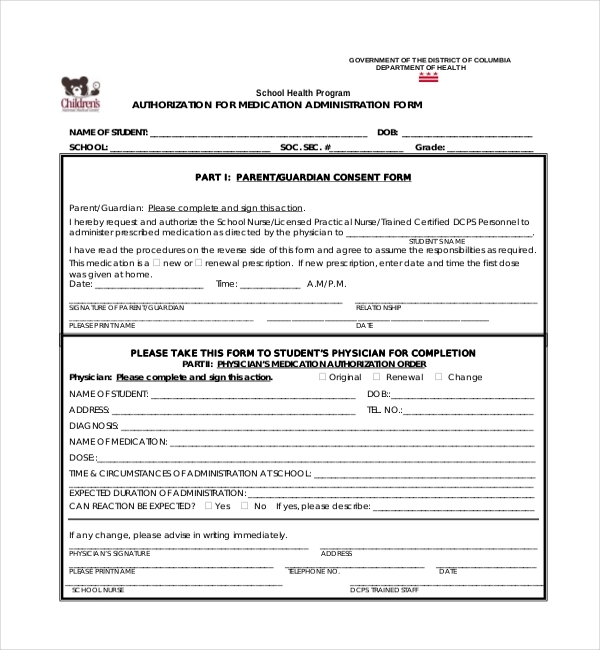 This form is to be filled up by parents or guardian of the child who will be admitted to Grandparents University. This form is divided in several sections. Some of them are health insurance section, information needed of the participant etc. All the fields are required to be filled up carefully. 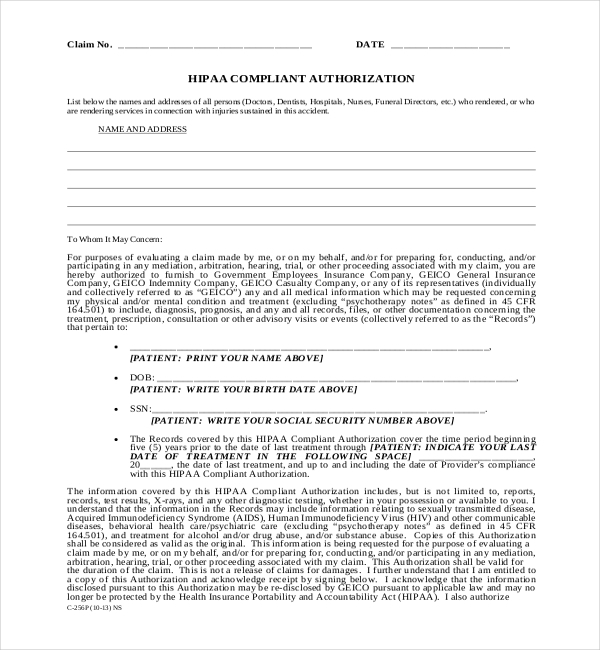 To review a claim, HIPAA medical authorization form gives the permission to GEICO permission to take our medical records and other related documents that describes the medical services and medical care of the injury in question. The form is reviewed for claim purposes. HIPAA requires medical information of the person in question so that legal body or government agency can evaluate as needed. All the fields are mandatory, unless separately specified not to. The information is of sensitive matters and need to be carefully treated. The forms are useful for those who need to be sure that proper steps are taken in case of any emergency that take place to a child. It is useful for parents or guardianwho can sign the forms and declare the medical authorization to the school or any other center, when they are not present for the child. The insurance firms require medical details of the illness or injury to pay for claims, pay workers compensation claims, or underwrite health and life insurance policies. For cases like injury, medical records as proof is important. This is because the proof for physical injury is required for analysis towards reasonable healthcare provisions, whether no damages are done or if malpractices are implemented or not. If the patient is going to a new doctor, he or she has to show previous Medical History. This is why medical authorization forms may come in use to release medical information. These forms can be used as legal proof in the court if malpractices are done. Any medical negligence can be found pout through these forms so that it is used for justice. They can be used for insurance claims. The claims help in getting the amount of money used for treating the patient. 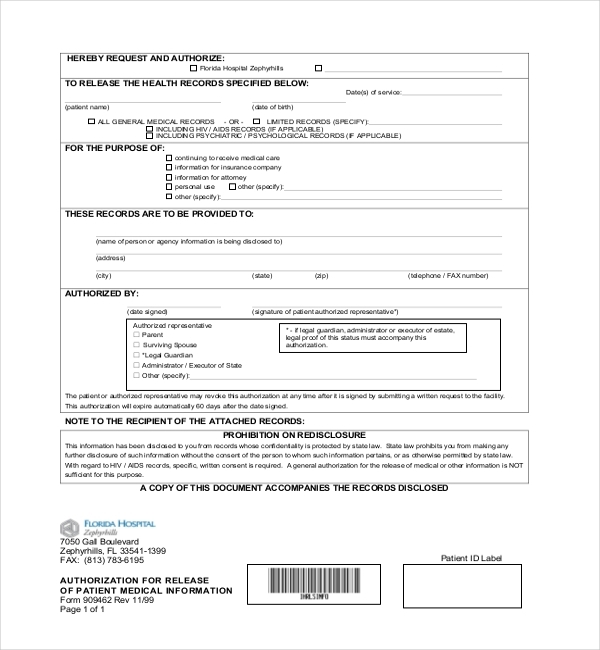 To how the medical procedure and medicines used this form can be used to show HIPAA for insurance. The forms are good for your own knowledge and having a personal record of your health. This is also helpful for them. Health care providers need payments before they disclose the medical records. They charge the patients for copies of the health records provided to them. The forms must be read carefully and then filled up. Any misunderstanding that is seen in the form must be clarified before filling them up as it may lead to more problems. To have a copy of the forms would be a wise idea. It will make sure that you have a duplicate one, even if the original is lost.